A loyalist paramilitary mural erected in Lurgan has been described as ‘sick’ by a local resident. The double mural, depicting a history of the Ulster Defence Association (UDA) and the Ulster Defence Union (UDU), was erected on the Avenue Road at the weekend. They detail a history of both organisations and the UDA mural despicts images of terror chiefs John McMichael and Andy Tyrie. One householder told of feeling “sick, scared and defeated” after being unable to get help from authorities to prevent the paramilitary mural being. He told the Irish News that he and neighbours had contacted local politicians and agencies to get help on stopping the mural being erected. Local DUP MLA Carla Lockhart said she was ‘aware of the situation’. “I will be continuing to work with all concerned. “I have been speaking with residents and those involved in the erection of the mural and believe that progress is being made,” she said. However local Sinn Fein Cllr Liam Mackle described the erection of the mural as ‘very worrying indeed’. “Rather than disappearing loyalist paramilitaries seem to be marking out territory in Lurgan. “Unionist politicians need to assist the local residents and make clear there is no place for these paramilitaries in Lurgan or anywhere else in the council area. “I will also be asking council officers what they are doing to help these residents,” he said. The local resident, who did not want to be named, told the Belfast paper a councillor had confronted those behind the display. “The lads were told of the upset they were causing. They told the councillor that the memorial was going up no matter what,” he said. “And so days later, under the cover of darkness, the giant printed placards were permanently attached to the wall. “I awoke that morning to see this horrible display. I am now living in front of a terrorist memorial. “Everyday I awake, I feel sick, scared and defeated. His suspicions first arose months ago when two men arrived and began plastering the brick wall before painting it blue. “They told my neighbours that they were fully sanctioned by the council, permission was given. They said they were building a First World War memorial,” he said. Armagh City, Banbridge and Craigavon Borough Council said no planning approval had been sought for the display and it was seeking further information. A spokeswoman for the council said it became aware of a new mural last week. 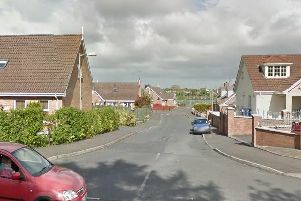 A PSNI spokesman said: “Police received a report of an incident in the Demesne Avenue area of Lurgan which occurred between the evening of Friday September 23 and the morning of Saturday 24 September.